1. Most games that I have are BIN only. There is no Cue file. Is that a problem? 2. The BIN file is red for most of my games but "Auto Rename Bin File" doesn't fix it and I don't have an "Edit Bin/Cue" option. Side-note, your directions are the most explicit and helpful out of anything I've seen on Reddit, Discord, etc. Thank you again. CRAP. I tried it anyway and it's doing what it did the first time I attempted this whole thing. Bleem install was successful. I followed your directions. I tried to add the game, I removed the USB drive when it told me to, I inserted it into the PSC, powered it on and then I get the brief white screen and the first half-second of the PS1 boot-up noise before the entire system shuts off. Never had that issue or missing Cue file. What program did you use to burn your game discs? I use Imgburn maybe you need the cue file? Just checked mines and all of my games have a cue file. I think I had the white screen happened once. Unplug it, unplug the USB, reinsert and plug it back on and see if that helps. If it doesn't maybe you need a cue file to make it work. I never tried it without the cue files. Try this video. Haven't tried it myself but it may help! What are some modding features we're still waiting on? I was tempted to nab the Classic today at Best Buy, but if it's worth waiting a little longer for more convenient updates, then I will. I just wanted an idea of where things were at, particularly in regards to storage solutions. The big one we're waiting for is BleemSync 1.1, which is promising OTG support to streamline everything. Currently you have to use the second controller port for your USB drive to implement the hacks, and there's a lot of variance in whether a particular drive is supported due to the limited power draw allowed by the 2.0 port. You end up having to do very simple hardware mod, using a powered hub in the port, or just being lucky that your drive happens to work. I'm using a 128GB 3.1 drive with no hub or mod, but I've seen a couple people complain that this exact same model doesn't work on their PSC. With OTG support we'll have the second controller port freed up as well as being able to reliably use any USB drive through the rear micro-USB port. It's already in a pretty good place, though. The SanDisk Cruzer 2.0 drives up to 64GB are considered reliable and will hold a lot of games without USB hubs or mods necessary until OTG arrives. If there's a good deal on the PSC it's worth jumping in. So the bundle that includes retroarch for PSC is not hosted anymore, does anyone know how to get retroarch on the Autobleem USB stick? I picked up this usb drive so I could finally get around to installing Autobleem and it appears it doesn't work. I was able to convert it to Fat32 and AutoBleem installed and loaded once and never again, I'm assuming it was a brown out or something of that sort, I knew there were compatibility issues but I thought someone had said that this one should work. Either way, does anyone have any advice on what to do next? Should I buy a new drive or grab a powered hub? For either of those options, does anyone have any suggestions that are currently available on Amazon or at Best Buy? Debating weather I should get one, it's cheap near me and in stock still. Can the controllers be used on computer or anything else yet? I'll note that you can't shut down the PSC with the power button with Autobleem 0.6 beta. It has trouble booting properly afterwards. This was tripping me up when I got started. You can only safely shut it down with the L2+R2 button combo from the autobleem menu. If it worked once, though, I'd think it would work again. Make sure to unplug the PSC, insert the thumb drive, and reconnect the power. If it really doesn't work out of the box, then a powered hub is the easiest solution for now, unless you're comfortable opening it up and doing the reportedly very simple power limiter mod. I don't have a hub, so I can't make any recommendations. They work fine on a PC (at least with Windows and Linux), and Android, and have mappings available so they're ready to use in RetroArch. Should be easy to bind with other standalone emulators. Whoops, I actually meant Bleamsync. I've been using Bleemsync. Does that also have to be shut down via L2+R2? Bleemsync doesn't need to be shut down in any particular way unless you're running RetroArch. In that case you need to quit RetroArch and then press the power button. The reason for this is that when you press the power button it's more like putting the PSC to sleep rather than actually shutting it down, and RetroArch doesn't behave very well when this happens. If you're saying the initial hack worked, then you could try reformatting your USB drive in exFAT and re-extracting the Bleemsync files to it. Otherwise if it still doesn't work you'll need to find a low powered USB drive (less than 100ma), buy a powered USB hub, or perform a hardware mod to remove the power limit on the USB port. Terrific, this topic was what I was looking for! Planning on trying Xenogears this way on the big screen since I got my Classic and could find a good place with everything added together! but its not registering? Even renamed the png to the name of the game. Is there an easy tutorial? I get Retroarch is really robust but I feel lots of info is fractured everywhere. Hard to know where to look. Would appreciate some hints. PS: I did download the big file for the system (SNES 500MB or so file) so I just dragged and dropped for the games I wanted to the "thumbnails" folder but it didnt work. Hmm, not sure what it takes to short a resistor, if I ever need to do anything hardware I usually just ask one of my buddies for help. I picked up one of those Sandisk Cruzer 2.0 64gb so perhaps that might work better. Saw it at target today for $39.99. How low will it go?! I got mine in Canada at Costco for $29.99. That's like $22 USD. So yes it will go lower. My WalMart's all have a tonne of them. If you buy one, don't open it during return period, in case it goes lower elsewhere and you can return. Some credit cards these days have 3 months price protection - if you buy something and it drops in price anywhere else, you can request a refund of the difference through your card provider. My chase card allows me to do this 5 times a year. Think I want one of these, can't believe how they'd dropped. Do you really think they'll drop further? Now that word is out that it's actually pretty useful, should I scramble for 39.99? 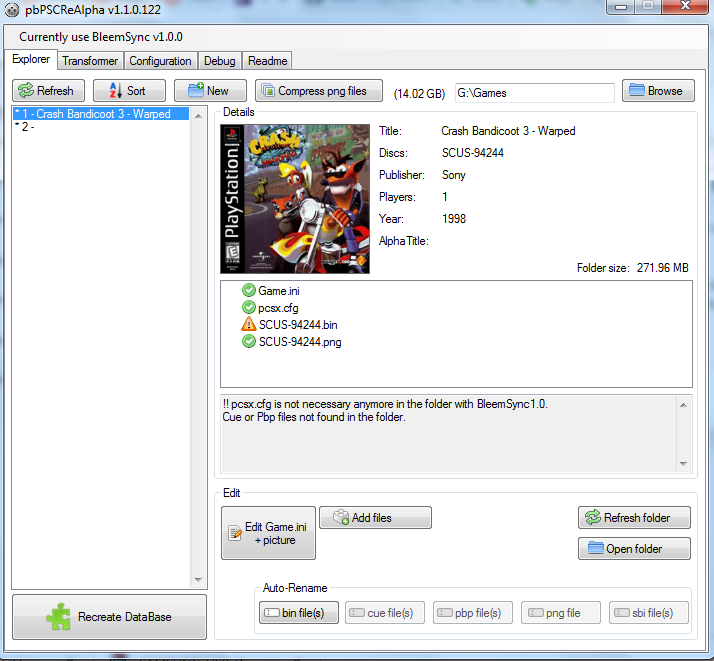 Been wondering, does this Bleemsync application can be put on the console, so the USB key doesnt stay on the console? I just want to fill up like about 15gb of the 16 in the console of my top like 30-40 games, leaving 1gb of space for save games. I dont want to put anything else than PS1 games, so i dont want to use retroarch. Wanted to thank you again. At the point now where I can load Bleemsync from PSC and my rip of Mega Man X4. It just freezes and stutters every 5-8 seconds. Currently trying to figure out why it does this. I can tell you I just tried Alpha 3. Screen simply went black. This is so disappointing. Maybe I should try again and wait longer? I didn't even see the PSX logo. Just got a black screen and it sat there for a full minute. Probably a question that's been asked already: Does this support any HID USB controller? I have a Saturn USB pad that would be great for this. In retroarch: Yes. In the bootup menu: Currently no. Try installing Retroboot on it. I have that drive and I am able to run Retroarch off it. Thanks for the suggestion, but the Sandisk Cruzer I ordered came in today and I'm happy to report that I was able to get it working with it quite easily. I also picked up a nice HDMI Switch and a 6 port USB AC Adapter, so I now have my NES Classic, SNES Classic, PS Classic, and PSTV happily sitting snuggly under my TV. Pre-ordered the Genesis MIni today too! Gonna buy one next Friday and probably pick up one for a friend as a bday gift. Is autobleem on a usb stick the simplest and quickest setup atm or have their been advancements ? Autobleem is the easiest for playing PS1 games, though it's not 'out of the box' for emulating everything else. You will need to download retroarch and it's cores separately which is a bit of a pain. Still overall, if you want simplicity it's the easiest method overall as of right now IMO. Thinking of finally giving this a go. Does anyone use a USB hub, and am I right in thinking this will allow you to use the USB stick with Bleensync installed AND the second PS1 controller at the same time? It also needs to be a USB 2.0 hub, right? Does anyone know if the Amazon Basics version will work? There is still a lot of stock around and demand is weak. Price will lower more in the coming months. Has to be externally powered unless you go into the device and physically mod it. Interesting... does it run SNES and Genesis stuff? It runs Retroarch, and most of it's assorted cores. N64 is spotty, but even things up to PSP run full speed. I’m trying to get the gist of this but, Autobleem is all you need to play PS1 games. That about right? Don't need both. You choose one or the other. Autobleem works by simply copying files to a USB stick on your PC, and plugging it into PSC. Bleemsync uses a windows app to do this. It's got more features but might be more cumbersome. Grabbed a PS Classic and a PNY Cache4 USB stick (64GB version). Managed to get the very first boot screen to display correctly and report back successful first install but the console never did the red-blink restart, so I think this USB stick is probably having the "brown out" issue, but I'm fresh installing everything right now. When I plugged it back into my laptop, it said that the USB stick was corrupted, so I've since reformatted it and am about to give it a second go. Going to try with a very old 4GB Sandisk Cruzer I have from my college days (it was given to me in 2006, I think?) and see if that works. I at least want the better emulator, even if 4GB is a bit sparse for adding more games. If that fails, I think I'll try and grab a newer Sandisk Cruzer tomorrow since that seems to be what most people are having success with. 1. Can you store and run the roms right from the flash drive without copying them to the core system? 2. Can they run from the zipped files? Many rom packs have each rom individually zipped. Will the emulator software run it fine like this? 3. How well does all the 2D systems work? From NES to SNES, NeoGeo, Genesis, etc. 4. Which controllers are supported? Wired? Wireless? 5. Can someone link me to a good tutorial video that is the most up to date? ive been trying to get autobleem to work and it just boots to the main screen, i tried 4 diffrent flash drives and no luck, is there some prequisite you gotta do before attempting auto bleem??? am i missing a step before formatting flash drive and moving over the folders? Did you rename the drives to SONY and unplug the unit before inserting the drive? yup and yup, right now im chalking it up to i got a bunch of incompattable Flash Drives. i orded one that is confirmed to work. now i dont have to put anything or do anything to my PS Classic to get AutoBleem to work? nothin like Henkaku on Vita? i should be able to put Auto Bleem on a fresh PS Classic and work? Just got a PS1 classic and had a question that I didn't see answered. Thinking about doing Autobleem as that seems easiest. I understand that for mutli-disc games its best to have a bin.file for each disk. thats fine for physical games but a lot of the PS1 games I have are PBP files I brought from PSN. How does that work, or does it?